We specialize in pumps and in designing pumping systems. Our staff is experienced in many different applications and industries. The combination of our pump expertise and the service and dedication of our specially trained installation and maintenance teams will help your next project run smoothly. Our focus on pumps and pumping systems offers the highest assurance of a project being properly designed and installed. Our team has decades of pump and pumping system design and installation experience. In addition, all of our personnel are factory trained and certified so you can be assured of the highest level of expertise in the entire pump rental industry. Each item in our inventory is in top condition. Every time a piece of equipment is returned to our yard, it is subjected to a rigorous inspection procedure and a thorough maintenance program. Exteriors are cleaned, valves are actuated, coatings and seals are inspected, paint is maintained and moving parts are lubricated. Serviceability and appearance are important. Our equipment functions as it should and presents a good appearance at our customers’ worksites. E-Pump responds to emergency situations on a 24/7 basis. We use company-owned trucks and trained drivers allowing us to tailor our service performance to our customers’ schedules. The equipment is delivered when you need it and where you need it. At the end of the rental, we pick up the equipment on a timely basis. E-Pump can design and assemble a custom solution for your next pumping project. Our extensive experience assures you that the assembly of your custom system is correctly installed and functioning as designed. Whether it’s a small job or large project we can design, deliver, and install a turnkey custom solution for your job site quickly and professionally. We tailor our billing to meet our customers’ requirements. Daily, weekly, bi-weekly, monthly…however you want it. E-Pump is the only rental company that guarantees to outperform any competitor pump size to pump size. 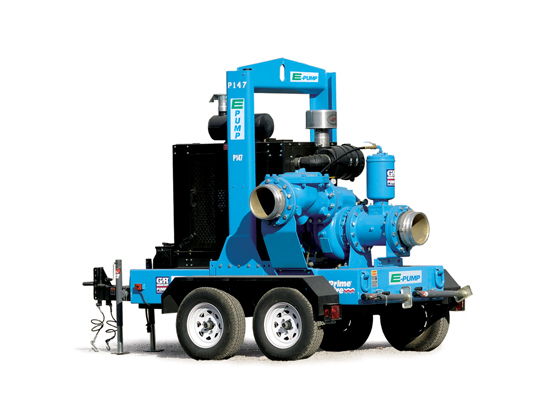 We have one of the newest and largest pump rental fleets in the Midwest region. Prior to shipment, all of our pumps are factory tested and documented to the industry’s highest standards at some of the most modern pump manufacturing facilities in the world, including the Gorman-Rupp plant in Mansfield, OH. Gorman-Rupp offers unparalleled quality manufacturing and conducts tests using actual suction lifts (almost all companies test using flooded suction). With branches in Ohio, Indianapolis, Indiana, Illinois, Pittsburgh, Pennsylvania, and Buffalo, New York, E-Pump serves customers throughout Ohio, Indiana, New York, West Virginia, Pennsylvania, Kentucky, Michigan, Missouri, Illinois and beyond. For your convenience, we have compiled a list of common terms used in the pumping industry.